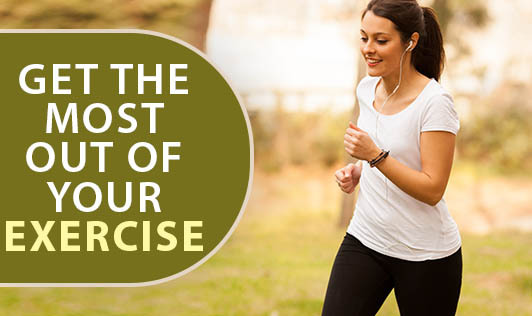 All of us know that regular exercise does wonders for leading a healthy life. Whatever form of exercise you enjoy doing; be it walking, weight training, running, swimming - exercise is beneficial for your health and well-being. But sometimes exercise can also have some unintended consequences, especially for beginners. When you begin with an exercise program, you may experience pains, aches, cramps and minor inflammations post exercise. These are normal results of repetitive movements, with specific exercises. But don't worry; here are some ways of how you can control these common aches and pains before they can hinder your exercise goals. Start gradually: Do not start exercising at high intensity for a longer duration from the day one. Start with just 5-10 minutes a day at low intensity and gradually increase both the duration and the intensity to avoid getting such aches or pains. Warm Up: It is a good idea to warm up before you start working out. Stretching and bending to warm up muscles can help prevent pain and inflammation later. Once you are done with the work out, it is also important to cool down just like the way you warm up. Take a Break: If you have pain, give a break for a day or two to ease aching muscles and minor inflammation in areas such as the knees, elbows and hips. When you resume exercising, consider getting back gradually. As a routine it is best to exercise just 5 or 6 days a week and give a break for at least 1 day in a week for your muscles to relax. Ice therapy: Ice therapy or cryotherapy is one of the most extensively used methods for treating inflammation and pain. It is easy to apply and highly effective. Use ice packs on the sore area for 15-20 minutes, several times a day. Compression: Applying compression to a wound has the effect of preventing excessive swelling. The most effective of these is by using a compression bandage which is an elasticized tube-like bandage that simply fits around the affected limb. It is easy to apply and the elastic provides the sufficient pressure needed to compress the sore area, reduce swelling and excess fluid, and provide support...all of which can reduce discomfort. Don't wrap them too tight, but do try wearing them the next time you exercise. Drink Water: Make sure you drink lots of water before, during and after your workout. Intense exercise coupled with inadequate water can lead to dehydration, which can cause muscle cramps, aches and pains. These strategies can be applied by people suffering from mild discomforts post exercise. On the other hand, some may experience more serious aches and pains that require the advice of a specialist such as an orthopedic specialist or physiotherapist. If you experience prolonged joint pain or strains of the ligaments or tendons, it would require medical attention to know the cause and the appropriate course of action. Forget the "Pain"... Just Keep the "Gain"!